Arundel School in Mt Pleasant, Harare has hiked second term school fees up to $10 800 local currency or US$2 455, for full borders. 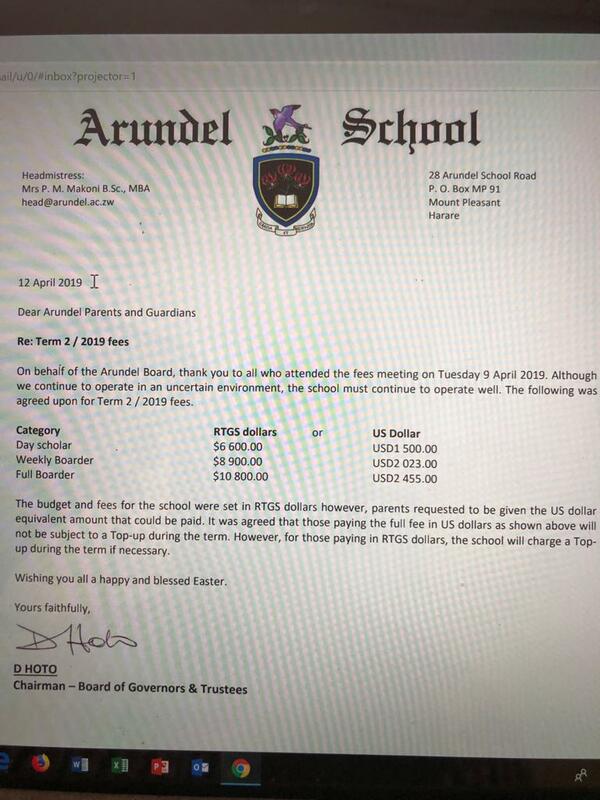 On behalf of the Arundel Board, thank you to all who attended the fees meeting on Tuesday 9 April 2019. Although we continue to operate in an uncertain environment, the school must continue to operate well. The budget and fees for the second term were set in RTGS dollars however, parents requested to be given the US dollar equivalent amount that could be paid. It was agreed that those paying the full fee in US dollars, as shown above, will not be subject to a Top-up during the term. However, for those paying in RTGS dollars, the school will charge a Top-up during the term if necessary. What is the reason of hiking the US$, US$ should remain fixed what should hike is the RTGS$ in relation with current exchange rate.